Quality is crucial when it comes to live video. Whether you do live streams, video calls or conferences, having the best possible video quality is paramount to achieving better outcomes. With that in mind, ManyCam has launched the RTMP Ingest feature to help the user connect high-quality equipment to their favorite live streaming platforms and video calling apps. In this blog post, we’ll cover what is RTMP ingest and give you a step-by-step guide to help you use this new feature. RTMP Ingest – What is it? 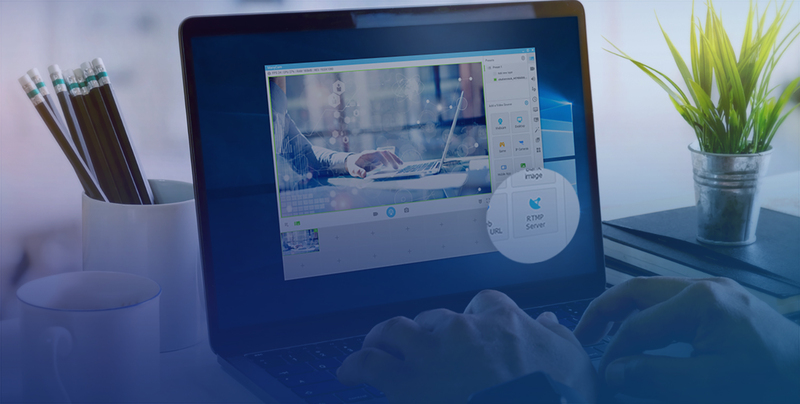 RTMP Ingest is a new video source option available in ManyCam, which allows users to add external encoders and any stream key as their video sources. In other words, if your live streaming equipment provides you with the RTMP info necessary, you can add it as your video source to ManyCam and then broadcast it to other platforms or connect to video calling apps. In the presets panel, you will need to add a new video source. To do so, click on the “+” icon, just like in the screenshot below. The feed will show up on ManyCam as soon as the connection is completed. Then you can start streaming to other platforms or servers. If this option doesn’t show up on your ManyCam yet, download the latest version here. The RTMP Input source can help you take advantage of the equipment you have to create professional live videos and make high-quality your video calls. The ability to connect external encoders through RTMP servers open up a wide range of possibilities when it comes to creating live videos. The ManyCam team is super excited about this new feature. So, give it a try today and let us know what you think. How can I get support for setting up Manycam? I have paid $49 and am not able to use the product. Is there any resource for someone who is new to Manycam? This is so very very frustrating. I am a teacher with VIPKID and many teachers use this product. However, I need help getting started and your company does not respond. Please please please respond.